Packt Publishing, the publisher of several Drools books and an active open source supporter, is celebrating the release of its 1000th IT book during this weekend. As part of the celebration they are offering free ebook downloads to registered users and users that register until September 30th. Congratulation to Packt and thank you for your support! Happy reading to all of you! a high quality book on. customers an easy to way to research their choice of free eBook. giveaway, allocated based on the number of copies of each title downloaded. We're happy to announce the release of Drools (Expert, Fusion, Planner, Guvnor) 5.5.0.Beta1. Get the latest artifacts from either the JBoss Maven or Maven Central. To try out the examples, just unzip one and run the runExamples.sh or runExamples.bat script. Join us for Red Hat Integration and BPM Week virtual event on October 15-18, 2012. There you will learn about Red Hat's integration and BPM road map, find out how recent acquisitions will be integrated into the portfolio, and gain practical knowledge from the engineering leaders that are driving the most popular integration, messaging and rules, and BPM technologies and standards. One registration grants access to all 17 information-packed webinar sessions! The virtual event is FREE. Sessions will be delivered live, and will also be available on-demand afterwards. One registration gets you access to everything! 4 Weeks Until Intellifest - Register soon to learn about Drools & jBPM. Only 4 weeks to go for IntelliFest 2012, in San Diego, start Monday 22nd of October. There are limited spaces, so register soon here. 8.00 AM: Breakfast Social – pre-laptop setup, and QA time with solution Architects. -Key will be provided to setup your laptop, so you can view and run the examples used during the talks. How we turn the Drools and jBPM communtiy parts into a world class product. Supporting and harvesting all the innovation done in the open community, Red Hat delivers reliable, dependable and integrated solutions for enterprise customers. Drools Expert covers the business rule engine. A gentle, example driven, dive into the Drools technical rule language and engine features. Learn how Drools does CEP differently. Our unified approach extends Drools Expert with a series of language and sub-engine extensions to provide temporal reasoning and event correlation. jBPM is a BPM engine designed for flexible processes, implementing and extending the BPMN2 spec. Built form the ground up to be part of a unified strategy for business automation and decision management. jBPM fully integrates with Drools Expert and Fusion. Drools Expert provides sophisticated web based tooling, around decision tables, guided editors and templates. Our decision modelling approach draws from the very best research found at Dr Jan Vanthienien school of Decision Modelling. 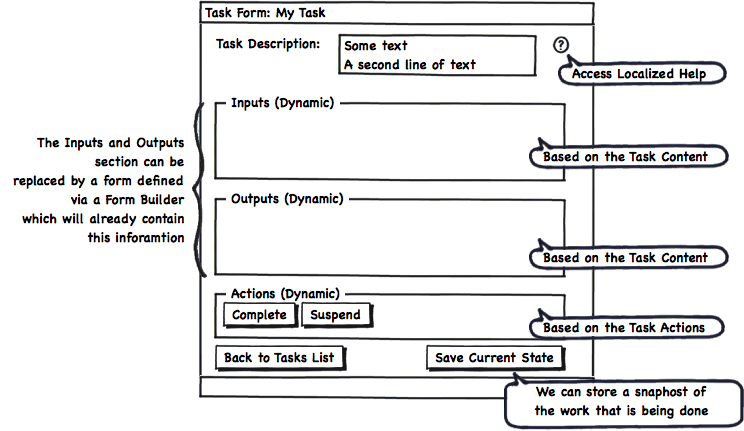 Human tasks are a central component of BPM. This example driven talk will build an example live, demonstrating what jBPM’s Human Task technology can do for you. Time for some hard play, learn how to build classic computer games with Drools. These also provide interesting exercises in BA requirements gathering. Whether it’s employee rostering, task scheduling, vehicle routing, bin packing or another planning problem: all organizations try to optimize their limited resources under constraints. Drools Planner optimizes business resources for normal Java programmers. Sometimes data quality is not perfect, so facts may not be known with precision and certainty. Likewise, crisp constraints such as hard thresholds might not be able to capture the complexity of a business policy. Drools Chance allows to apply gradual and/or probabilistic constraints to uncertain or vague data. UberFire is a new project that forms the foundation of our 6.0 web tooling. It’s standalone framework that provides a sophisticated workbench framework for the web; where everything is a plugin. Come learn about the Uberfire, and how you can use the workbench to build your own web applications. An open presentation and discussion about the design ideas, principles and goals that are driving the development of Drools & jBPM version 6.0. This will be an optional and informal session where attendees will have the opportunity to learn about what is coming, contribute ideas and provide feedback that will be taken in consideration by the development team. Run at the same time as "Drools&jBPM and Beyond" and Beyond. Solution Architects are on hand to help you with your coding problems, and running examples. What is a “Rule Design Pattern”? We have added a new and exciting feature to jBPM and the jBPM Designer: Business Process Simulation. This is still an experimental feature and subject to changes, so community input and involvement is very important. Business Process Simulation allows you to to simulate your process models, and view helpful simulation results that can guide you to improving your models as well as be able to better understand and describe them to your peers and/or customers. The below video showcases this new feature. Please give us your feedback by either posting your questions/opinions here or hit us up on the jBPM user mailing list, IRC, or the jBPM user forum. and use one of the three different wars generated in the /target directory. You can use jBPM Designer with Drools Guvnor 5.3.x, 5.4.x and 5.5.x. I just found a nice interview with Ronald G. Ross about SBVR, that helps shed some light on how this works in relation to If-Then format's. * By increasing the tick we slow down the time to the next move. * with both the EatFood and EatPowerPill rules. Once we support 'switch' with nested blocks we should be able to do the following. Note I also removed the 'no-loop', as it's no longer needed with property reactive. Version 5.3 of Drools introduced the ability to declare Knowledge Listeners via the Spring XML. You could declare 3 types of listeners to be added to the KnowledgeSessions - AgendaListener, WorkingMemoryListener, ProcessEventListener. The drools-spring module allowed configuration of these listeners to KnowledgeSessions using XML tags. These tags have identical names as the actual listener interfaces i.e., <drools:agendaEventListener....>, <drools:workingMemoryEventListener....> and <drools:processEventListener....>. With this addition, all the requisite loggers can be defined declaratively and attached to the Knowledge Sessions. All the logger types supported by Drools Expert can be configured via XML. rule "Give 10% discount to customers older than 60"
rule "Give free parking to customers older than 60"
extends "Give 10% discount to customers older than 60"
rule "Give 10% discount and free parking to customers older than 60"
rule "Give free parking to customers older than 60 and 10% discount to golden ones among them"
rule "Give free parking and 10% discount to over 60 Golden customer and 5% to Silver ones"
Here I wanted to give a 10% discount AND a free parking to Golden customers over 60, but only a 5% discount (without free parking) to the Silver ones. I achieved this result by activating the consequence named "giveDiscount5" using the keyword break instead of do. In fact do just schedules a consequence in the agenda, allowing the remaining part of the LHS to continue of being evaluated as per normal, while break also blocks any further pattern matching evaluation. Note, of course, that the activation of a named consequence not guarded by any condition with break doesn't make sense (and generates a compile time error) since otherwise the LHS part following it would be never reachable. rule "Give free parking to customers older than 60 and 10% discount to golden ones among them - 1"
rule "Give free parking to customers older than 60 and 10% discount to golden ones among them - 2"
That translates into the following three rules. Notice for the free parking I explicitly add in all the negations that are implicit to the above rule. rule "Give free parking and 10% discount to over 60 Golden customer and 5% to Silver ones - 1"
rule "Give free parking and 10% discount to over 60 Golden customer and 5% to Silver ones - 2"
rule "Give free parking and 10% discount to over 60 Golden customer and 5% to Silver ones - 3"
At IntelliFest this year there are two Drools workshops. There is the "General Drools&jBPM Workshop", which is a series of high level talks explaining the various features of Drools&jBPM. The second is the workshop "Rule Design Patterns in Production Systems", by Dr Wolfgang Laun, which is aimed at rule authoring techniques. The agenda for both is below, you can see the more detailed and up to date agenda here. Only 7 weeks to go, and there are limited spaces, so register soon here. Most of the times the Front Ends Applications which are built on top of Process Engines contains a fair amount of screens/components dedicated to deal with Human Interactions. On this post the requirements to build these panels will be dissected to define which bits are important. The main idea behind this analysis is to be able to evolve the current state of art of the Human Interactions screens/components to the next level. This screen is usually compared with the Inbox folder of any Email Client application where per each mail we have a row and in order to see the content of the email we need to drill down into each item. All these features will represent the basic pieces that needs to be provided by the, but on top of those bits a set of user customizations needs to be allowed by the tool. In order to adopt a Generic Task List interface most of the companies requires a high degree of customization on top of the basic set of features provided by the tools. Most of these customizations are domain specific and are extremely difficult to provide in a generic way. But what we can provide, as tools designers, is several layers of flexibility to allow each company to modify and adapt the generic tooling to their needs. I can list a very extensive list of features that can be added, but we need to be careful and be focused on the features that will make our task lists/inbox usable and not more difficult to use. So there is an extra factor that we need to consider, and that factor is how the end users want interact with our software. The cruel reality is that there is no single answer, we need to provide an infrastructural framework flexible enough to allow each user to customize his/her experience in front of the software. 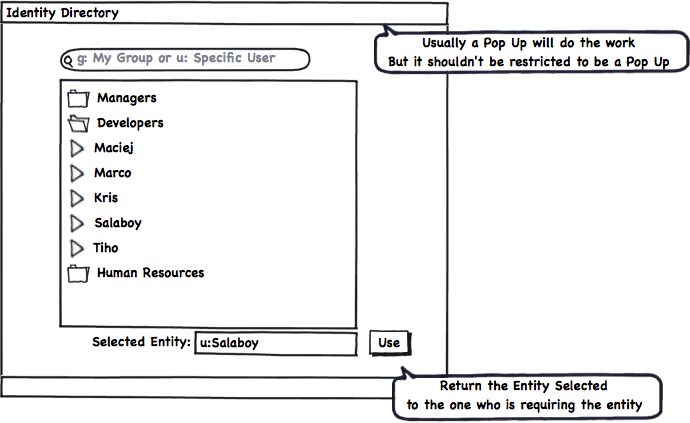 Each user will need to be able to add or limit the set of features that they want to use. The company need to know that if there is a feature missing, the learning curve to add it is almost none and the developers needs to be comfortable with how these additions or removals are done. If we do a similar analysis for the screens intended to allow the user to create a new task or to modify an existing task we will start finding a lot of repeated requirements. The previous figure shows a very simple and fluid mechanism to quickly create new Tasks. In order to create a task we just need a name and all the rest of the properties will be defaulted based on global or the user configurations. If we want to edit the task basic properties we will have a different panel with the most common things that the user will want to change, like for example: Due Date, Priority and Assignment. 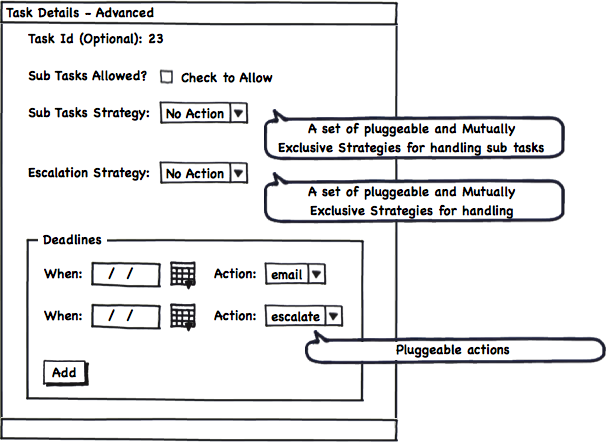 Sub Tasking strategies, Deadlines and Escalation Options can be shown if they are needed. There are cases when these advanced behaviors are not required, and for that reason they should be all optional at the UI level. If Sub Task are allowed by Default a separate panel embedded in the Task Details view can be added to allow the quick creation of subtasks that are related with a specific parent Task. Once the Sub Task are created, they can be edited via the normal panels, which will probably add the reference to the parent Task and some bits of extra information (like for example the parent task name and assignee for reference). Something that we usually leave to the end is the Help feature. As you can see in the following figure, with a very simple panel we can write a set of localized help texts which will guide to the person that needs to work in such task. For simple Tasks, the help can be avoided, but for more complex tasks, such as legal, medical, government tasks which usually contains CODEs and regulations this can be very useful. One very important aspect of every task is the information that the task will handle and how this information will be exposed to the user and how the UI will gather the required input from the user. For this reason we will need a way to define the Task Input Data and The Task Output data. The Task Inputs represent all the information that will be displayed and is required by the user in order work on the task. The Task Ouputs are the data that the user must enter in order to complete the particular task. As extension points we can also add a set of Completion Rules that will need to be validated in order to automatically decide if all the data is coherent and the task can be successfully completed or if the user will be pushed to add more or modify the current information. In the same way we can define a simple mechanism to define which actions will be available for each specific task. 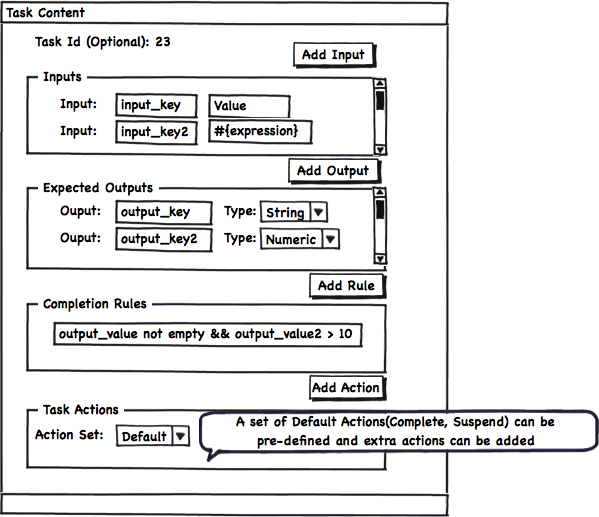 Creating a set of Default set of actions the user just can select between different groups of standard actions that will be rendered inside the Task Form. Most of the time, if our task is in the context of a Business Process, the Task Inputs and Task Outputs can be inferred by the process data mappings specification around the Task. Task Inputs and Outputs can also be defined by using a Form Builder which can aggregate information from different places and allows us to have a more flexible way of defining the information that will be handled by the task. A mixed approach is also valid. It's important to understand that Task Inputs and Outputs are vital to handle complex tasks that are in some way standard to the company and are executed multiple times. For a simple TODO task, which will merely serve as a reminder to ourselves, we can avoid adding such complexity. The idea of Inputs and Outputs also make more sense when we are creating a Task that will be executed by a different person who doesn't fully understand the goal of the task. Specifying the Inputs and Outputs we will be formalizing the task expected results as well as the required information needed to do the expected work. As you may know most of the Task Lists systems also provide the possibility of showing in a separate list all the tasks assigned to the groups were a certain user belongs. The tasks displayed in this list are not assigned to any person in particular, but they can be claimed. So, let's say that you don't have any task to do today, you can go to the Group Tasks list and claim a task from there. Once you claim the task, the task is automatically assigned to you and no one else can work on it. For this specific kind of tasks you will have a specific Task Action to release it if you can no longer work on it. As soon as you release the task, the task is placed again into the group tasks and anyone inside that group can claim it. There are sometimes when we will want to display both lists in the same screen which make total sense if the user wants to have a quick overview about the overall work load related to him/her. All the identity information is usually handled by a separate component and it is usually central to the company. From the UI Perspective is important to have a set of simple tools which allows us to query the company directory and relate a User to a Task or query for Groups to be able to assign a Task. One important thing here is to notice that this panel depends on the underlaying technology used to contain the Identity information. If your company uses Active Directory or LDAP or a Database this component will need to be adapted to connect to your Identity Directory and consume data from it. There is no single generic solution that fits all the environments. If you think that all the features described here are important, or if you are planning to adopt a solution like the one described in this post please get involved and share your thoughts and extra requirements that you may need. I will start sharing my personal experiments on the basic components exposed in this post. This is a very good opportunity to join forces and help in the creation of these components. If you wanna help and learn in the process please write a comment here or contact me via the public jBPM5 channels. The more requirements that we can gather, more re-usable will be the end results. This post cover what I believe are the most important bits that every Task Lists Oriented Software should provide. I'm not saying that these features are enough but this post will serve as the starting point for more advanced mechanisms to improve how the work is being done. I've intentionally left out of this post two important topics: the Form Builder and Task Statistics and Reporting. Both topics will be covered in future posts. Now that you reach the end of the post please read again the "Get Involved" section and drop us a line with your comments/suggestions.